Ultragloss is celebrating their 20-year Anniversary this February by offering retail customers a special deal and great ideas for dealers. Ultragloss is celebrating their 20-Year Anniversary this February by offering retail customers a special $20 Bonus Package and issuing 20 Tips to Help Dealerships Build a Stronger Customer Base. The $20 UG Cash Back Special: For every $100 a retail customer spends towards a paint service, they will earn $20 UG Cash towards their next Ultragloss service. 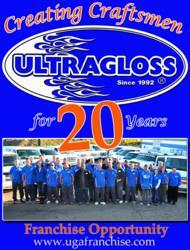 For more information, click here: Ultragloss 20-Year Anniversary Specials. The Automotive Appearance Specialists at Ultragloss work both on cars at their retail location and mobile on-site at the car dealerships in Northeast Ohio. They specialize in low cost cosmetic repairs on vehicles that typically have damage which hinder the sale or trade-in of the vehicle. They are able to save their clients money without compromising the quality of their work. By offering an affordable repair, this allows the dealership to sell cars more quickly and get the most out of their inventory. Ultragloss offers a variety of repair services to both the dealership and retail customers in Akron, Ohio from their various divisions (Interiorz, Dentz, Glazz, and Tintz). Customers come to Ultragloss for several reasons—to preserve their car, to cut costs on lease turn-ins and insurance jobs. They save the customer money on those annoying scratches and stone chips that they would normally be charged for when turning in the lease or simply trying to preserve their car. In some cases, customers come to Ultragloss before they file an insurance claim. Ultragloss is often a fraction of the cost of a body shop and allows for the customer to get the repair done for less than their insurance deductible. Ultragloss was founded in 1992 as a mobile service for area car dealerships and soon after added a fixed retail location. By 2001, Ultragloss had five mobile trucks on the road and a retail business that was quickly expanding. In 2009, Ultragloss had 17 trucks on the road, two fixed retail locations, four supporting divisions and were servicing over 200 dealerships throughout Northeast Ohio. In May of 2010 with the help of franchise industry experts, Ultragloss began offering an automotive franchise. Since May, the company has launched 3 franchises and looks forward to the year ahead with the slogan: “Creating Craftsmen for Life”. “When I first joined Ultragloss in 1994, I wasn’t sure what was going to happen. I shared Steve’s vision, passion, and work ethic. Needless to say, 18 years have gone by and we have grown every year,” Josh Chancey, general manager, recalls. Now Ultragloss is currently offering franchises in Ohio, Pennsylvania, Michigan, Kentucky, and West Virginia with means to expand outwardly over time. Their ideal candidate is a hardworking, self-motivated individual who strives for perfection and is dedicated to representing the Ultragloss brand. No experience is needed.